2009 movie "Fast & Furious" was filmed. trumped-up charge designed to keep him from being in the race, so O'Conner can take his place. You can find this apartment building at 1820 N. La Brea Ave, in Hollywood. Here's a Google StreetView panorama of the place. After the race, we see a street party, a scene that opens with racers spinning their cars in the street. Toretto & O'Conner are both at the party. They get interviewed & learn more about the boss, Braga. Pan-Pacific Warehouse, at 544 Mateo Street. still appears in faded paint on the front of the building. It's frequently used for filming. Here's a Google StreetView panorama of the brick building. a call from the cartel, giving him the coordinates for their first big drug run. the FBI monitor him, and tell him to slow down - advice which he ignores. This is a tricky location, a telephoto shot that is hard to see in real life with the naked eye. is the Santa Monica (10) Freeway, near the junction of the 10, 5 & 101 freeways. In the photo above, the camera is looking east up 7th Street, from around Wilson Street. They used a very strong telephoto lens which compressed the apparent distance between objects. Here's a Google StreetView panorama of the view. O'Conner arrives at the coordinates and finds himself inside a big, old warehouse. O'Conner, since his car is bugged. But he manages to rip out the wire before he gets caught. at 985 S. Seaside Ave., on Terminal Island, at the mouth of L.A. Harbor. gritty, industrial setting down by the docks, half the time it was filmed at Southwest Marine. Here's a Google StreetView panorama of part of the complex. of large trucks. The scene above shows those trucks heading down the freeway. just north of the interchange of the Long Beach (710) Freeway and the Century (105) Freeway. The big tunnel chase scene is next. It's supposed to be in Mexico. docks of the Los Angeles harbor, at San Pedro. Along with a lot of green-screen. just before the south end of Signal Street (where the dock ends at the ocean). the same Crescent Warehouse company, so it may share the same address. Here is a Google StreetView panorama of the exterior of this behemoth warehouse. After they return from Mexico, we see a car pull into an industrial area filled with oil wells. Mia, Toretto's sister, knocks on the door of a shack there, and O'Conner opens the door. She has come to care for her brother, who was wounded during a shootout with the bad guys in Mexico. be there in person. The idea is to catch the guy, and lop the head off the cartel. You can find the bridge at the south end of the Harbor (110) Freeway. the camera is looking across the water towards Terminal Island. Here is a Google StreetView panorama taken on the Vincent Thomas bridge. under that bridge. But it was hard to tell from the shots whether they actually filmed there. the underside of that bridge, the look of the columns do seem to match perfectly. 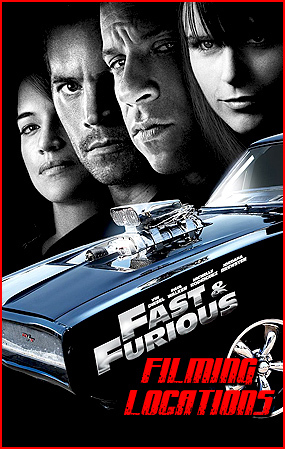 Some of the photos on this page are stills from the DVD of "Fast & Furious"